It’s not about bagging bucket-list miles, or even bragging about bagging holiday sights, it’s about stopping and looking for the clues that point to natural and man-made structures – or subtle signs of earlier lives that are integral to a locations ‘sense-of-place’ so often missed in the quest to capture that grand vista, or complete that big trek. The Chilterns are well endowed with remnants of Iron Age lives including barrows and over 20 hill forts; Ivinghoe Beacon, Boddington Camp at Wendover Woods and Pulpit Hill Fort are just three I have visited, that cluster along the ancient trade route that is the Icknield Way or the Ridgeway long distance trail. Some hill forts sit on obvious sites, others are not so obvious, as they are covered with beech woodland and making sense of the site is difficult for the untrained eye such as mine. 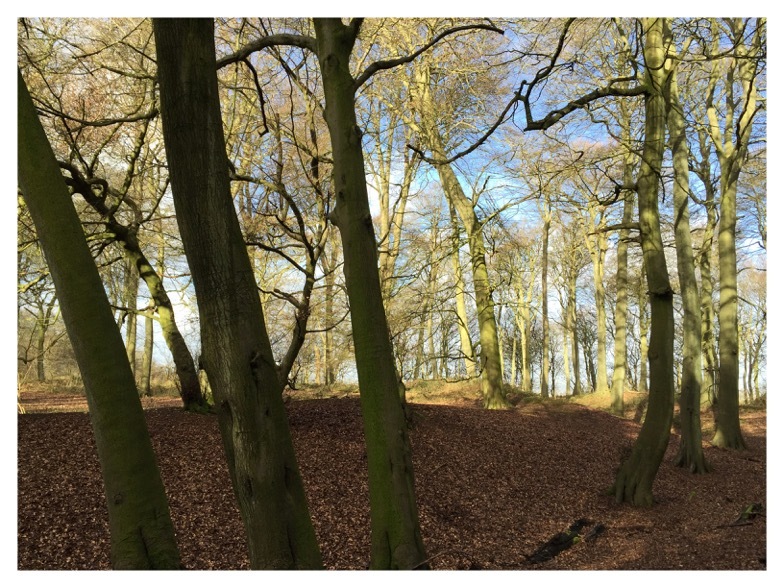 I had no idea there was a hill fort in Wendover Woods until I was inside it. Fortunate that my visit was in winter when the Pulpit hill fort earthworks are centre stage and not competing with verdant plant life that closes gaps, adds shapes and confusing shadow. The Pulpit Wood hill fort earthworks are clearly visible in winter. With just the earthworks remaining, this site feels compact, perhaps more so as the trees seem to crowd in around you. A modern feature I expect as there would have once been structures on this site. The overhead rubbing branches made for some spooky moments as it was otherwise completely still. No birdsong, no voices, only the rushing wind overhead. Understandably, those early Iron Age Chilterns’ residents would seek safety above the Vale of Aylesbury and places of danger, and used the natural height and contours of the land as fortified refuge. I have no idea why there are so many forts in this area; perhaps the neighbours weren’t friendly, or the wildlife was too familiar? 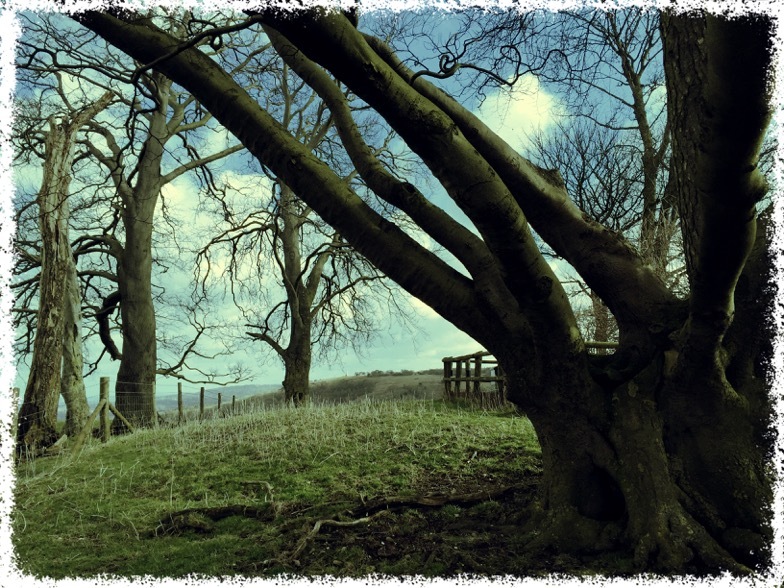 I am drawn to Pulpit Hill as not only is the origin of the name a mystery, but not a huge amount is known about the people who lived and died there. The site is also not covered in annoying visitor interpretation, it’s up to you and your imagination. Its shape is a clue, as even sitting as it does within the cluster of Chiltern hills, like Ivinghoe Beacon, it naturally commands the landscape, like a pulpit in a church. Chequers Knap commands the local geography. I made way for a ‘latest gear-clad’ group of walkers and stood in a deep dirty ditch whilst they poured around me like rocks in an avalanche, barely acknowledging my presence as they marched on Wendover. They reminded me of when I last passed through this area and certainly don’t recall seeing a fraction of what I have enjoyed on this slow visit. I was too busy bagging bucket list miles to take the slightest notice of what was all around me; lovely views to be enjoyed with the summer leaf canopy at bay from not-so-obvious vantage points, ancient box woods nestled into a sheltered slope, the site of the hill fort itself, dis-used saw pits, beautiful carpets of vivid-green moss, natural shapes and symmetry, a rusting iron gate without an accompanying fence, trees covered in graffiti and others with strange bumps and lumps upon them. All there, if you only look. Winter is the ideal time to enjoy the view across to Coombe Hill before the leaf canopy fills the sky. As to emphasise my point of not having to cover a great distance to explore somewhere, Pulpit wood and hill are right at the centre of a fascinating corner of the Chilterns that also references the Romans, the Normans, the English Civil War, a country church or two, a mysterious large cross cut into the hillside, the Prime Minister’s country residence, great pubs and miles of beautiful countryside – worth more visits and another blog post clearly! 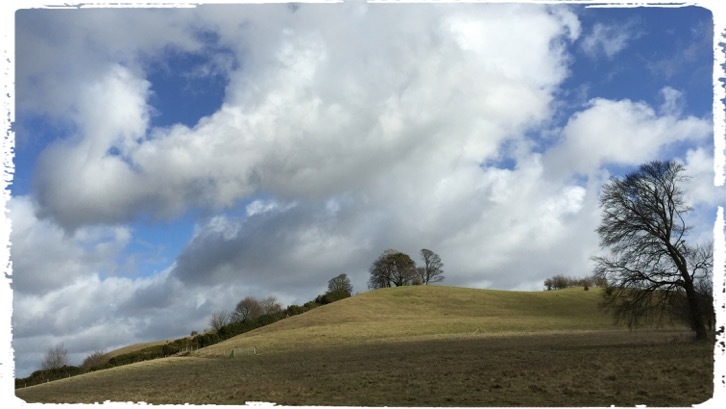 This site can be accessed from the National Trust car park on the Longdown Hill Road nearest to Monks Risborough. There is a reconstruction of an iron age house at the wonderful Chiltern Open Air Museum and several local walks to enjoy. The Chilterns Conservation Board has lots of suggestions and route maps. For information on planning a visit to the Chilterns or even as short break, the Visit Chilterns website is worth a look too. Informative and inspiring read thanks Mary, one day……. I’d be delighted to show you around.